Built in 1909, Scottsdale’s Little Red Schoolhouse is a testament to the Progressive values, attitudes, and aesthetics that shaped the growing community at the turn-of-the-century, and women and children were at the center of it. Middle-class values of propriety, productivity, and personal responsibility guided Scottsdale’s civic leaders as they envisioned and constructed a permanent school, and they demanded high standards in the female educators charged to teach Scottsdale’s young pupils. Inside the Victorian-inspired façade of the handsome one-story brick building on Main Street—now the Scottsdale Historical Society—a circa-1910 classroom exhibit recreates the look and feel of a Progressive-era center of learning, a place where strict rules for teachers and students guided their behavior inside and outside the classroom. As the public space designated for the “preservation and betterment” of children-- the future citizens of the community--the schoolhouse and its management was a serious matter. Circa 1915, any young woman who wanted the position of grammar school teacher in Scottsdale School District #48 needed to be a proper, chaste, and industrious individual, no exceptions. Sometimes not much older than her charges, a teacher was expected to be a superior role model for her young scholars. Conduct unbecoming to an unmarried young woman, such as loitering, smoking, or gallivanting around outside of town, was not permitted. Since town leaders steadfastly believed that one’s physical appearance reflected inner morality and spirituality, the proper personal attire was equally important. Young women who dyed their hair, dressed too flamboyantly or scantily, or smoked need not apply. Virtuous singlehood was also a requirement, as a young teacher should neither be too loose with men nor invite any males to distract her from her important duties. This ethos of educator professionalism complemented, but also transformed, customary roles for men and women and traditional divisions of labor. Women took the lead in education, since tending to children’s physical and moral well being was women’s work. 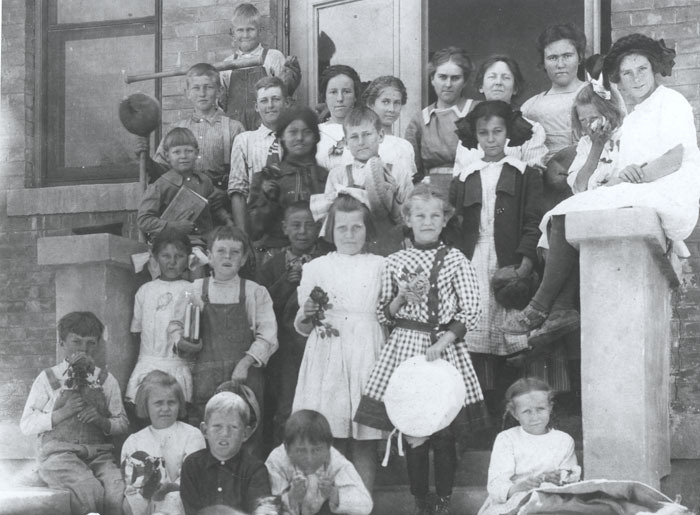 Scottsdale’s first teacher, Mrs. George Blount, taught children in her home. With the advent of a public school, some rules changed, while others did not. Turn-of-the-century Scottsdale teachers like Hattie Green performed the domestic roles of educating children, cleaning the classroom, and modeling middle-class ideals, but outside of the home and with a wage of $45 a month. With “respectable” employment and status, female educators in Scottsdale and across Arizona gained cultural and political worth in their communities. This essential “womanly” value helped Arizona women in 1912 to win the right to vote several years before the 19th Amendment and universal suffrage for all American women. Flowers at School: Over 100 students in nine different grades attended the Little Red Schoolhouse by 1916. In this image, students of all ages posed on the steps, some holding flowers for the annual Spring Flower Show. ~ Source: Image courtesy of Scottsdale Public Library. 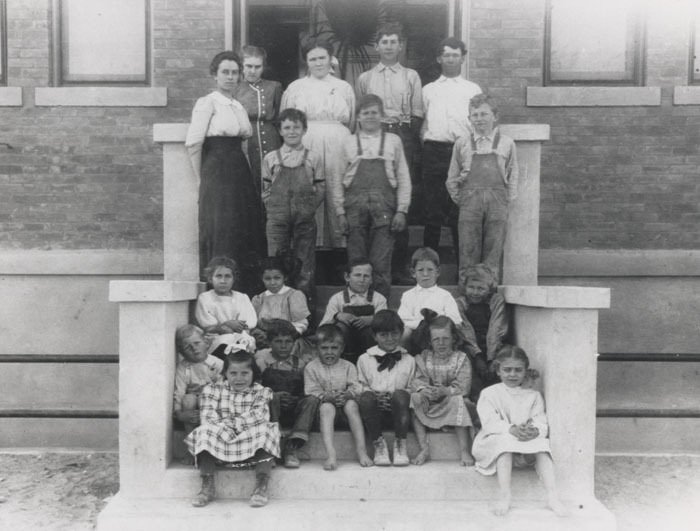 Teacher and Students: A teacher and her pupils stand on the steps of Scottsdale's Little Red Schoolhouse looking very prim and proper. ~ Source: Image courtesy of the Scottsdale Public Library. 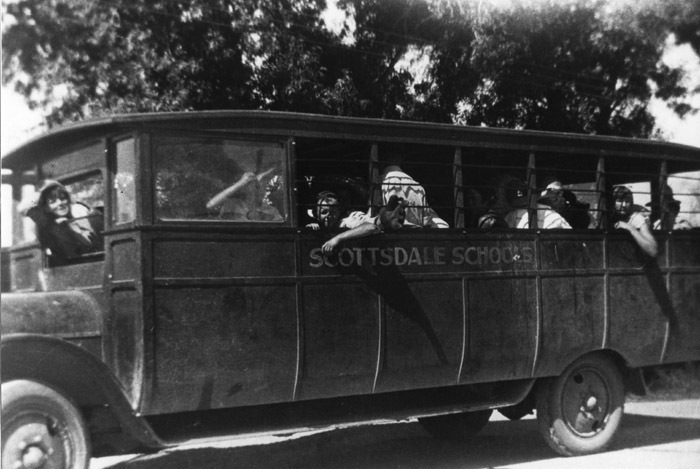 Early Scottsdale School Bus: In 1923, enough children lived outside walking distance of the Scottsdale Grammar School to warrant bus transportation. Bus riders initially paid one dollar a month for the service, but in 1924, the school approved free district-wide bus transport for students. ~ Source: Image courtesy of the Scottsdale Historical Society. End of School Celebrations: At the end of each school year, the whole town gathered for the Scottsdale Grammar School's annual ceremony and celebration. 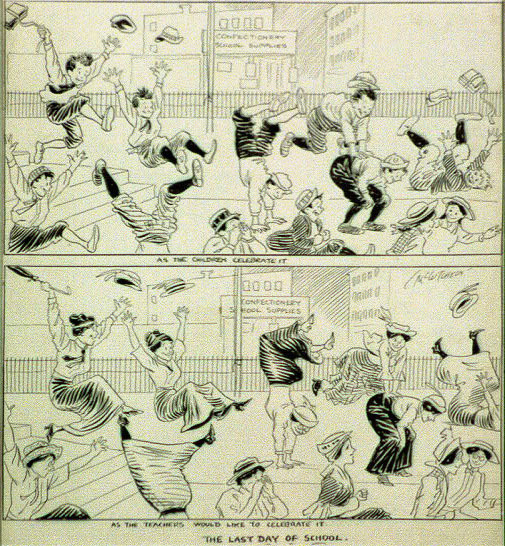 The teachers were likely as excited for a break as their students, as suggested in this John McCutcheon comic that appeared in the June 25, 1915, edition of The Chicago Tribune. ~ Source: Image courtesy of the Library of Congress, Art Wood collection of Caricature and Cartoon. Betty Drake reminds us of how uneasy a teacher's life was in the early twentieth century. Written by Megan Keough; narrated by Betty Drake. Recorded at Scottsdale Channel 11; courtesy of the Papago Salado Association. 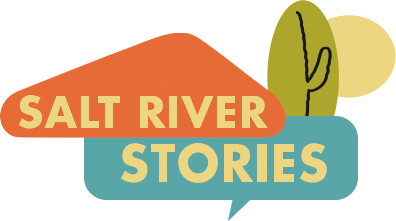 Stephanie McBride-Schreiner, “Turn-Of-The-Century Teachers,” Salt River Stories, accessed April 20, 2019, https://saltriverstories.org/items/show/17.